Blog: Do you have a plan to prevent and control weeds? The key to managing weeds is identification. Understanding the life cycle, how they spread and their susceptibility to different chemicals or other control methods. Most weeds belong to three categories, summer annual, winter annual and perennial. Summer annuals germinate in the spring once ground temps reach 55 degrees. They will bloom and produce seed up until the first frost in the fall. Common summer annual weeds include grasses such as barnyard grass, crabgrass, and goosegrass; and broadleaves such as black medoc, spurge, and purslane. Winter annual weeds germinate in late summer or early fall, overwinter as small but dormant plants, then flower and produce seed in the spring. Winter weeds usually die once the weather warms up. Common winter annual weeds include annual bluegrass, common chickweed, bittercress, and henbit. Perennial weeds are weeds that live longer than two years and are classified by their method of reproduction as simple or creeping. Simple perennials spread by seed, the roots are usually fleshy and can grow very large. Examples include common dandelion, curly dock, and broadleaf buckhorn. Creeping perennials reproduce by above ground stems (stolons) and below ground (rhizones). Examples include nutsedge, bermudagrass, and ground ivy. Most perennial weeds can produce seed also. Using the right application at the right time can significantly reduce the population of weed. Most herbicides fall into three categories and are systemic or contact. Preemergence weed control, usually in granular form, is applied before weeds emerge and provide moderate control of weed seedlings. This should be applied in early spring before the ground temps reach 55 degrees. If existing plants grow densely one application will do. If plants do not cover the ground entirely another applications is recommended 4-6 weeks after first application. Postemergence weed control, usually in liquid form, is applied after weeds emerge. The characteristics of postemergence weed control are important before deciding which ones to use. Systemic herbicides are absorbed and move through the plant. Examples are Round-Up and Finale, these are used for controlling weeds that are actively growing. Contact herbicide only kills the part of the weed it touches. These are good for small annual weeds but will only burn back the leaves of perennial or large summer weeds. Selective herbicides will only target specific weeds and non-selective herbicides target everything they touch. Extreme caution should be used in selecting the right herbicide for the right application. Even with the best preparation and chemical control, weeds are pesky and can easily take over your entire bed if left unchecked. 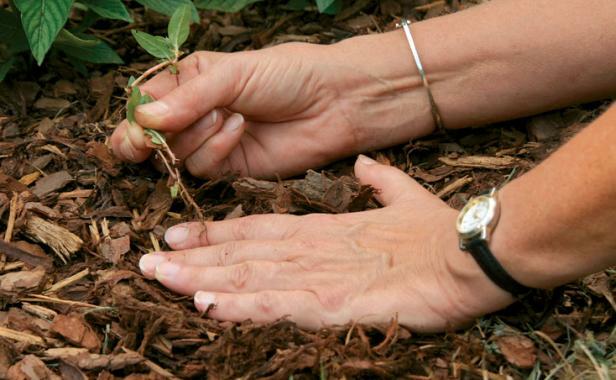 It is recommended that you mulch your beds every year to help deprive young weeds and seeds of sunlight. Remove young weeds before they go to seed and perennial weeds before they can spread. Controlling weeds in the surrounding areas will also help control weed seed and vegetative spread into your beds. It is important to develop a weed control plan for all seasons of the year. By staying diligent and knowledgeable of what you’re dealing with you can keep the weeds at bay and enjoy the beauty of your landscaping.